DynoTune Product, 013.2-Fast Response liquid temp Probe - DynoTune, Nitrous systems, Purge kits, Nitrous Bottle heaters and more! 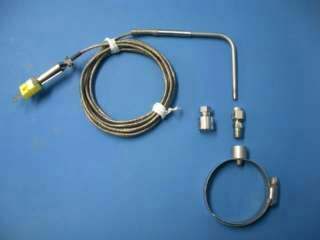 Fast response liquid temp probe with yellow spade connector. The Depth adjustable probe and is super fast responsive! Braided stainless cabling. Also comes with a screw on fitting! 84" long with RFI noise shielding bult in. This is bye far the best probe in the industry. It's sealed tip is great for measuring fluid temp etc.. NOTE: DOES NOT COME WITH CLAMP OR FITTING AS SHOWN!